This is a long one, folks. You should get a snack. Most of my make-up is applied with brushes. 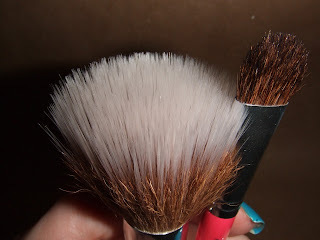 I wear Bare Minerals powder foundation, so I use brushes for pretty much everything. I don't have a lot of duplicate brushes either, they are way too pricey for me to have 15 of the same brush. Plus I don't wear make-up everyday, so it's not really a wise investment for me. Bare Escentuals offers a product they call "Quick Change" that you can use to quickly clean off your brushes in between colors. But at $18, it's a bit out of my price range at the moment. I figured I could find a good recipe online for a homemade dupe...but no. I decided to try and figure it out...with a little help from my friends. These are all really rough ratios. I ended up adding more alcohol at the end because I wanted this stuff to dry faster. 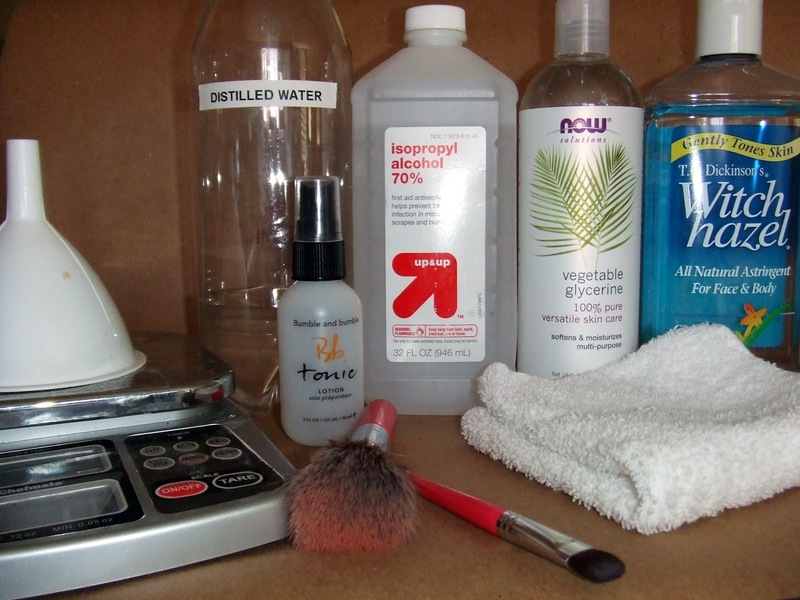 But if you add more alcohol, you should add a drop more witch hazel and glycerin so you don't dry out your brushes. 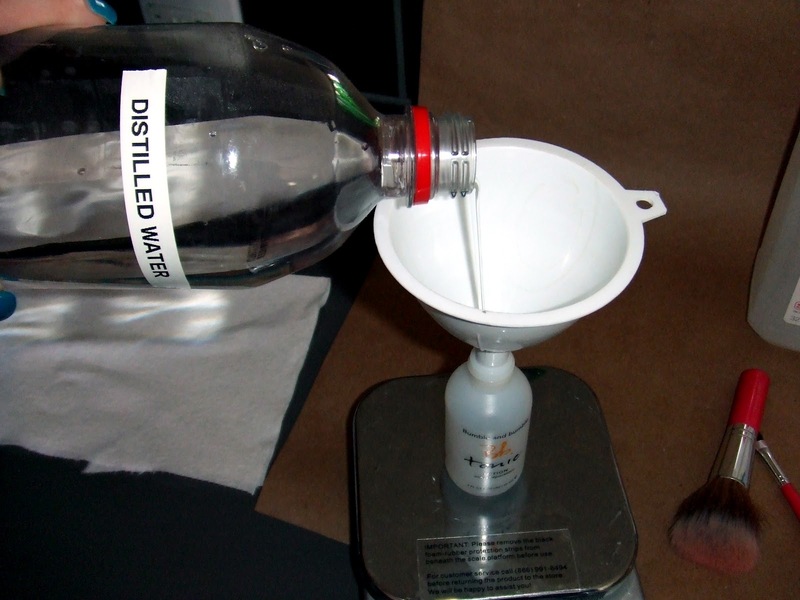 adding the distilled water. 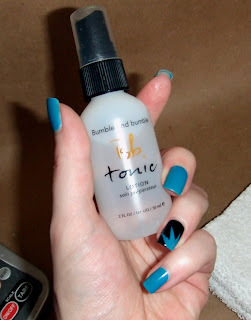 And yes, I keep a small bottle of this in the house for beauty related stuff. Our tap water is 40% rocks, I'm almost positive. add the alcohol next. The bottle will get warm here, but don't worry. It's completely safe. add the witch hazel next. You don't have to use witch hazel, but I wanted to use some sort of toner in this recipe, and witch hazel is an excellent toner. then remove the funnel and decide you don't have enough alcohol...add a bit more. put the spray top back on your bottle and give it a good shake. 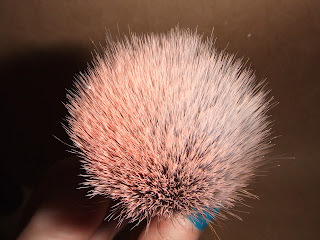 Here is one of my blush brushes. It's actually pretty clean because I shampooed all of my brushes a few days before. 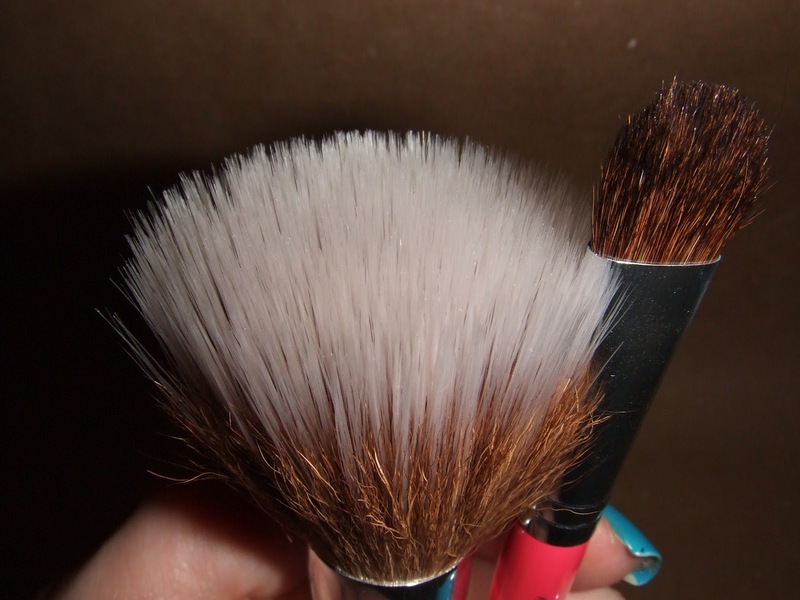 This brush has white synthetic bristles on the tip, so it's the best to show the before/after. peachy pink blush...dunno what brand. 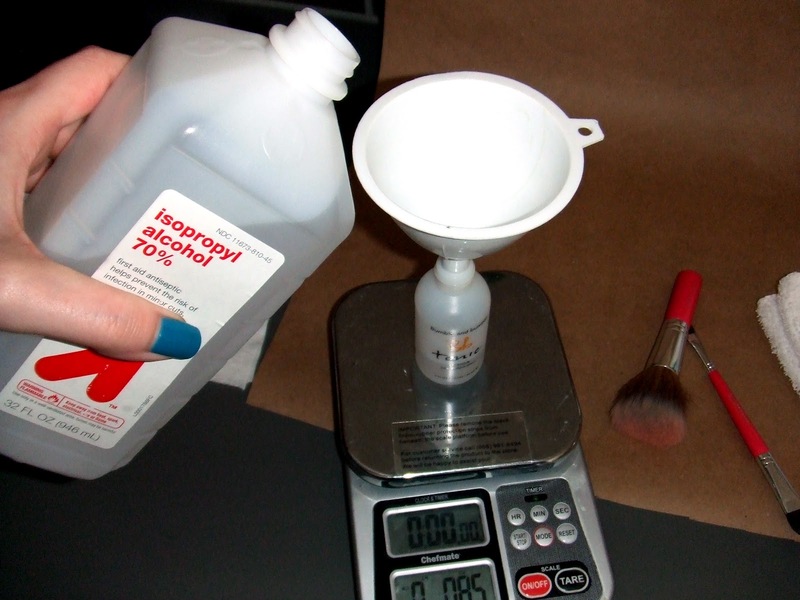 I sprayed a bunch of the mixture, probably too much, on the cloth. Then I swirled the brush around until it looked clean. my potion seems to work. Looks mostly clean. We'll see when it's dry. And here is where I used actual science-type-thinking! 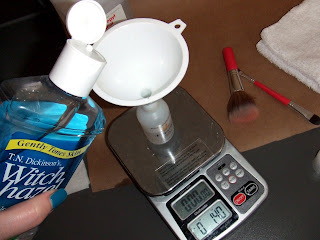 (My husband was so proud) I actually cleaned two brushes in this test: the one pictured above and a small eyeshadow brush. I wanted to see if different sizes dried differently. Both brushes still smell like make-up, which I kind-of expected. 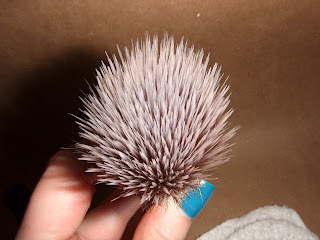 This isn't a proper brush cleaning. But there is no noticeable color left on either brush, not even when I swipe it against a white paper towel. Both brushes are still too damp to use. The large brush pictured above is completely dry and usable at this point. The smaller brush was still a tiny bit damp. Both brushes are completely dry and usable. I think I used too much of the spray for this first test, so I did a second one with a small smudge brush that had recently been used with navy shadow. 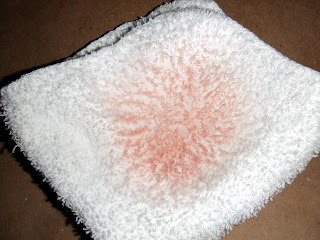 I sprayed five sprays on a clean rag and swirled the brush around until no more color was coming off. I checked back in five minutes, and it was completely clean and dry. 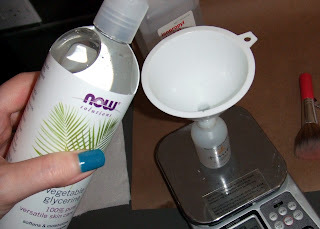 Five sprays is definitely enough to clean the make-up, and five minutes is pretty reasonable time-wise. 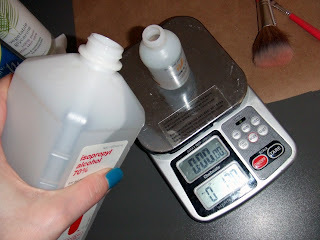 I think that when I make this next time, I will add just a bit more alcohol to speed that drying time up even more. both my test brushes. Perfectly clean! come back to clean, dry brushes! I'm pretty pleased overall on how this turned out. I was a little worried about trying to dupe a product I had never actually used. But thanks to a secret informant, it turned out brilliantly! And the best part is, now that I've saved some money on this I can absolutely get some of the new Bare Escentuals eyeshadows! come visit me over at bedlambeauty.com if you have any questions or comments about this post! I also am unclear on the measurements but wanted to say you can get vegetable glycerin at whole foods and specialty natural type stores.